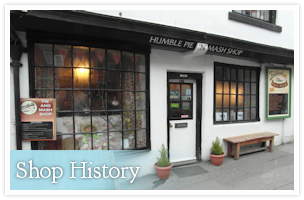 Humble pie is a sixteenth century shop, lovingly restored back to its timber framed beginnings. Come and relax in front of our open fire and unique surroundings whilst enjoying some of our traditional home cooked fare. 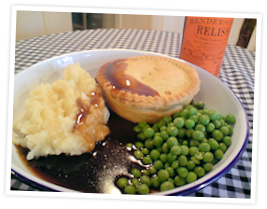 Come and try our range of meat or vegetarian pies that can be enjoyed on their own or for a classic combination try with our mash, peas, and topped off with delicious gravy. Ideal for lunch or supper! We also sell a range of hot and cold beverages. Humble Pie is a family run business, all our pies are homemade and baked fresh everyday on the premises, we only use the best natural ingredients and never any bad fats (man made hydrogenated fat). 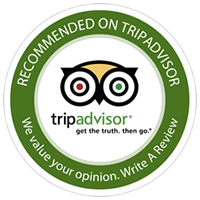 Over the years Humble Pie has been providing an antidote to the area's plethora of chippies, whilst maintaining traditional seaside charm. Homemade fresh each morning, each pie is encased in their made-from scratch pastry, and comes in a massive range of flavours using meats and veg from local farmers. From traditional Slow Braised Steak with Stout & Leek, to the more unusual such as Sausage & Black pudding pie or Hommity Pie (every veggie customer's favourite! ), the vast array of flavours is sure to satisfy anyone. 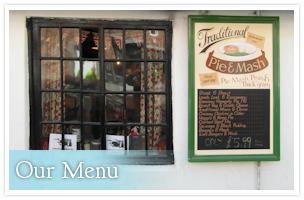 With an entire dinner coming in at under £7 per person, Humble Pie'n'Mash is perfect for a comforting yet uncostly dinner and a fantastic place to feed the whole family. 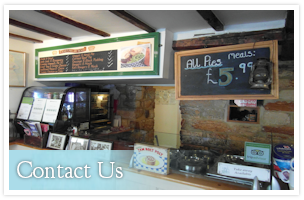 So come and try one of our mouth-watering pie's, and wash it down with a traditional ginger beer or a good old british cup of tea.